Need a quick, light and healthy meal? Or a delicious brunch? Perfect for sharing? Here you go! 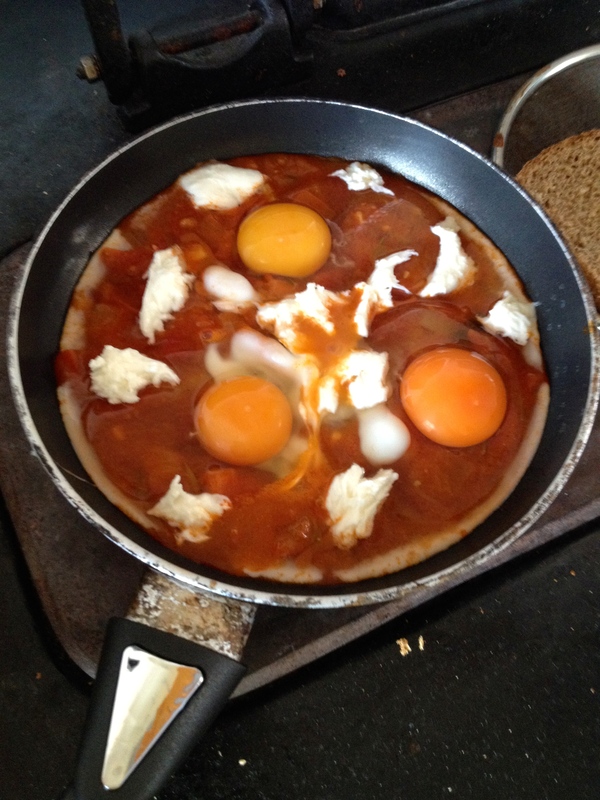 Nutritious and protein-rich eggs on a bed of homemade tomato sauce, with some (preferably) homemade bread to dip in. Try baking some bread of your own with some of these recipes. Tomato sauce is really rich in the antioxidant lycopene, as it is more active when tomatoes are cooked. I will add a tasty tomato sauce recipe soon. Meanwhile…dip in! 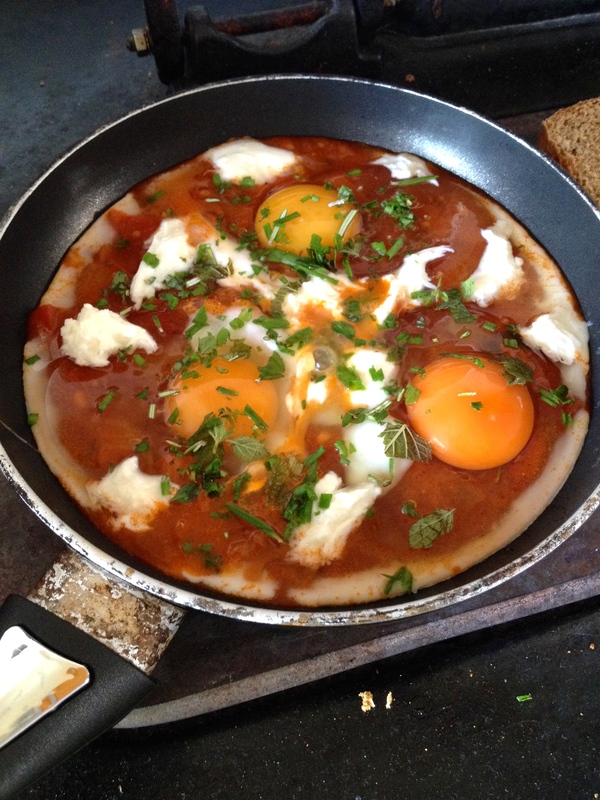 This recipe is adapted from The Londoner, a blog I can’t stop reading! Heat up your tomato sauce in a small ish frying pan. When it is bubbling away, crack your eggs and pour them gently on top. Keep on a low heat and don’t stir. Tear up some pieces of mozzarella or crumble some feta and dot around the eggs. Chop up your herbs and sprinkle on top of the eggs. Add a grind of black pepper and leave to cook gently for 5 minutes or so until the eggs are set but the yolks are still runny (that’s the best bit). Toast your bread if you wish or keep it soft, then take to the table and get stuck in! 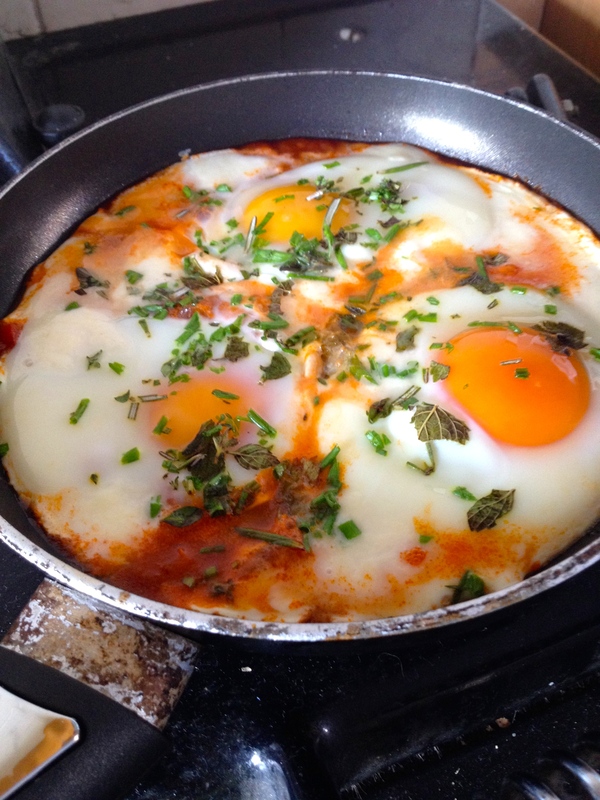 Posted in Recipes and tagged bread, brunch, dinner, eggs, herbs, lycopene, protein, tomatoes.